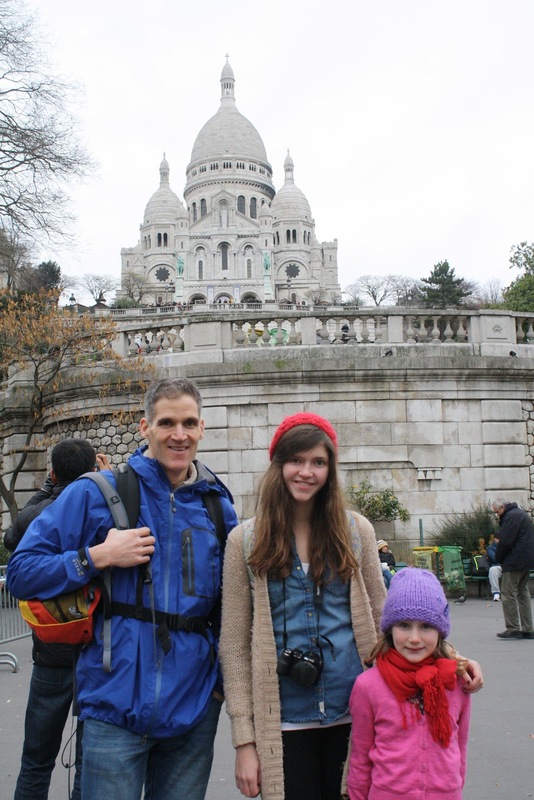 Admittedly, Sacre Coeur is not my favorite place to go. It is busy with people which is great if you like to people watch, but for me it is just really crowded. It is the best place for cheap souvenirs though. If you are in the market for what I call "trinkets and trash" this is the place. The same t-shirt will cost you $2 more at the Eiffel Tower and the shop workers will not bargain with you. Time: really just depends on how much time you want to wander. You could easily spend a few hours. Scattered throughout the city are these merry-go-rounds which at Christmas time are free to ride. And you know what free means, Eden wanted ride over and over and over. As I mentioned before there are always a ton of people here making the steps leading up to the church impassable. The day we visited there was a tuba concert. I am not sure they were all tuba's but they were all big horns--no trumpets. My photograph isn't the best, but all those people on the stairs are playing an instrument.